I have been calling this my home for the past 30 years. Gradually over 12 years, this lodge has grown from 2 small rooms into 16 luxury rooms at the main house and 4 log cabins at the water’s edge. After a lot of planning we are finally busy with our solar powered comfortable cottages. These houses will be powered by the sun’s rays, 85% carbon-neutral, built by passionate eco-minded De Zeekoe members using toxin-free building materials. 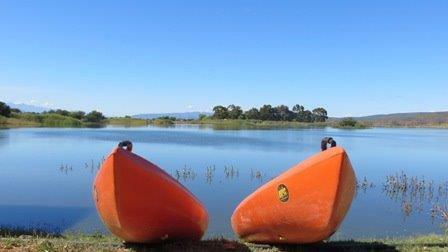 Activities we offer include canoeing, self-guided walks , fishing ( carp and bass ), swimming in our newly revamped saltwater swimming pool, bird watching with 162 species and horse riding, with Christine , as our guide , to inform guests on all the farm activities and the interesting places to visit in and around Oudtshoorn. Yet another successful horse, running & biking endurance race at De Zeekoe in September, was hosted by DE ZEEKOE. The wild meerkat tours, with the guide , Devey Glinister , is such a highlight for our establishment , many guests mention that these tours were the best during their trip to South Africa. Welcome to Shy 5 world. 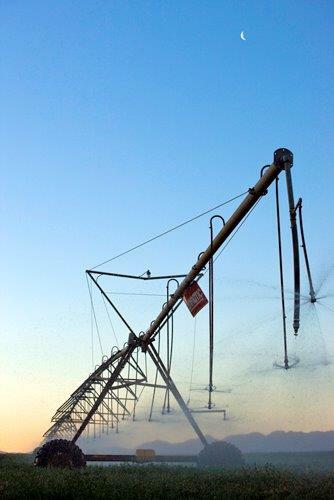 Our main production consists out of Alfalfa (lucern), Bonsmara cattle and sheep on a 2000 hectare farm. Although this is a semi-desert area, we have 3 big dams which are fed by two rivers namely the Groblers- and Olifants river. We use central pivot points for the irrigation. Currently we are busy setting up a game fence on the farm, so soon guests will be able to view Buffalo, Eland, Kudu, Springbuck etc while staying with us. This time of the year in particular portrays the growth of the new flowers and plants that we find in this region. This once again proves to me that De Zeekoe is indeed one of the 17 hotspots of the world with overlapping flower zones. Our vegetable and herb garden provides sufficiently for our everyday use. We opened our new bar recently. Guests can enjoy anything from ice cold beers to a selection of spirits and cocktails. Guests can enjoy watching DSTV sport outside on the patio while overlooking the Olifant’s river and our magnificent Karoo sunsets over the distant hills; while the children can enjoy the jungle gym within eye sight of their parents.